You've waited for it so long and we also! 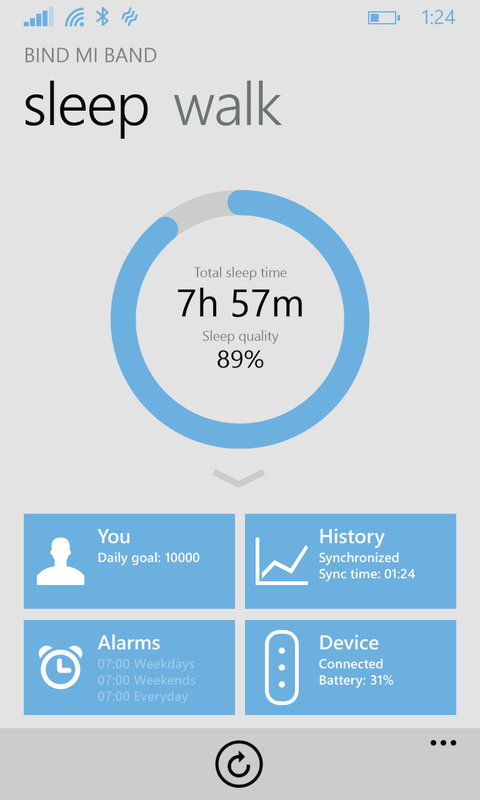 Sleep tracking is now finally released in public version of "Bind Mi Band". Now you are able to know how much time you spent in bed and how long you actually slept. Also, you'll see how many times you woke up. 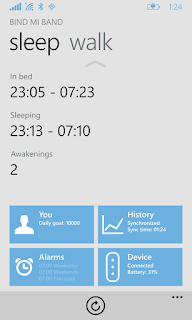 Additionally, the gauge on main screen displays how good was your sleep. More info about sleep tracking you can find on this page. This is very first solution, that will be greatly improved in coming months, when activity history section will be completed. As a pleasant bonus, in this release we included calculation of calories you burnt walking during the day and the distance walked. Finally, main UI was redesigned in a new way to be more clear and informative. Also, many issues were fixed and a lot of improvements were done, that are not visible, but significant. To know how interesting for users is our small product and to be able to make further improvements, new features will be available only in PRO version of application. It has two options: lifetime subscription and 1-year subscription for half price. Also, statistics of purchases will allow us to concentrate on most active markets when we will start to localize application. We really hope that you'll like the new update. If you have any questions, suggestions, see bugs or experience other issues, don't hesitate to contact us. P.S. Many thanks to BETA-testers group, who sent their reports. We really appreciate this. UPDATE: If after update app crashes on start, please, just unpair and pair again Mi Band in Bluetooth settings. Thanks for adding much needed sleep tracking, don't mind buying pro version. I don't see the LED lights blinking most of the times like if I reach 1/3 goal like that , is it not available ? Thanks for this great efforts, Ian! Thank you a lot for support! And what about notification? Incoming mails, calls, etc etc? Any chances? Is it possible to implement sleep history? Not just last sleep. Yes, it will be done in future versions. I don't think it will be so popular, but thanks for suggestion! Please insert the Bulgarian language! 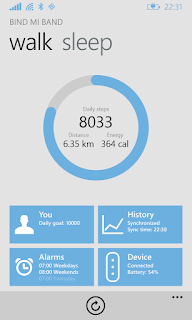 Any possibliltt to export data to Microsoft Health and Fitness ? To ruin the interest for this app? Not really clever. What do you mean about ruining interest to app? If you can export data from mi band to others apps, you could have access to better features compared to bind mi band. I think it's better to support your initiative. Hey, many thanks for your last release, i've just bought pro licence for sleep monitoring, it's working great but still needs more functionality. 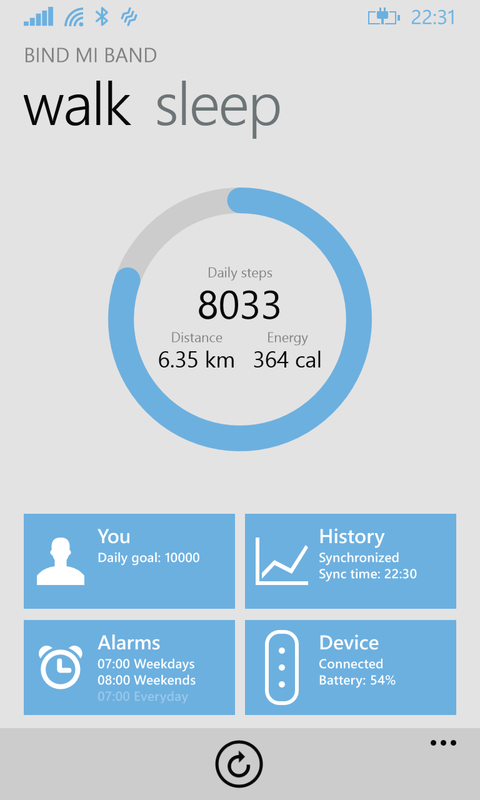 mi band is very popular in Poland to its low price so as windows phone, it could be even more popular if this application get polish language pack, i'm a big fan for mi band and also for your app so i can translate all text in this app to polish and send you, for free of course, the only question is are you interested? This is really good! I don't get yet to localizations, but I'll make a call and you will be able to participate in it! Just write me on mail (from contacts page) your MS account email. Bought Pro version two days ago. Reinstalled app, bind and unbind MiBand. 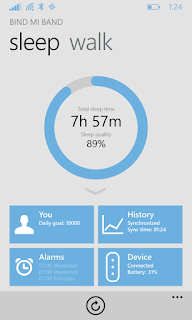 Everything works like a charm except sleep tracking. All I get is "We have no info about your last sleep..."
Please, contact me in mail from contacts page. Aaaaand it's works! Everything is OK now. Great app! Thanks for your work and support! What is the price of a pro license ? 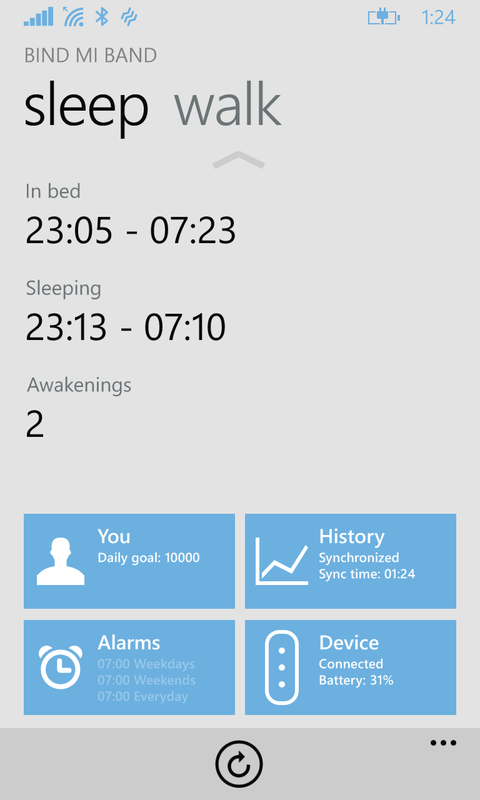 How does the sleep tracking feature work? I just need to fall asleep and the band will track my sleep data? Please let me know, I want to go to bed tonight and view my results tomorrow morning. Good looking app, keep up the good work Ian. Another question. How come the 3 LEDs don't light up when you reach a certain level? Example, my daily step goal is 10,000 and I'm currently at ~4100 yet non of the LEDs are lit to show my progress. Any ideas? They usually light up, but it's really hard to notice. It's not dependent on application you use, it's internal Mi Band feature. Would be nice if it where visible at what time the Awakening periods where registered . Nice work first of all. The steps history looks and works great. Smart of you to add both graph and listing. I was wondering what is in store next. Is it sleep history first or detailed version of steps? Or something else all together? Like maybe binding the apps with microsoft alarms and reminders? I have the pro version but, sleep is not tracked correctly. The first two nights it showed me in bed until I woke up to go to the bathroom at 03:00, it did not then record the rest of the night when I returned to bed and sleep. Last night it recorded from when I returned from the bathroom at approx 02.45 (and not from when I went to bed / sleep at midnight) until 06:10 when dogs woke me but, I stayed in bed and returned to sleep until 07:10 when my alarm rang. Is this a general problem or is it something I'm doing? i need pro version but there is some with payment option... how and what is other payment option ?? ?